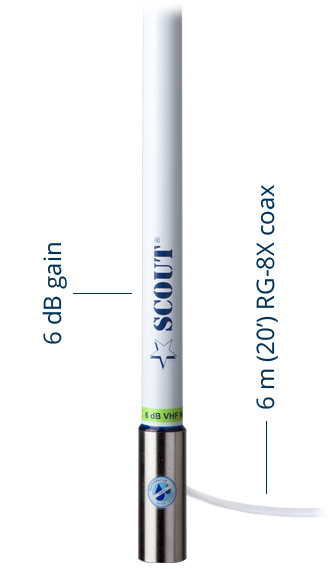 The KS-43 is the best performing VHF antenna of the Scout range, specifically designed to guarantee long range communication and endless duration for boaters that want more than a good VHF antenna. Collinear-phased, made with solid brass and copper elements and extra heavy duty fiberglass 1,5 mm thick. 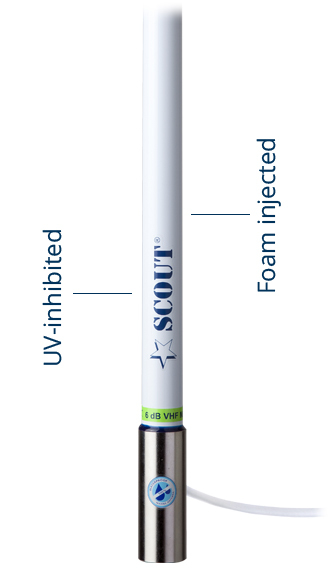 Moreover the antenna is totally foam injected with the Scout 100% waterproof technique, making it perfectly sealed and with an outstanding resistance to harsh environment. Water, wind, ice and high speed are good friends. The fiberglass whip is ice-white painted and UV-inhibited, to make the antenna shine like no other. The antenna is supplied with 6m (20′) high performance RG-8X cable with 97% copper braid coverage, that guarantees a perfect shielding from external interferences. Stainless steel ferrule with standard 1″ x 14 threads to fit on every type of mount (stainless steel/chrome brass mounts are suggested).